Potty training your child can be an intimidating step to take for any parent who has never done it before; but what about potty training your child with special needs? What about your child who may have very limited language and communication skills? Talk about an intimidating task... However, this is always very high on the list of priorities of parents seeking assistance for their children with special needs. So often I hear things like "If he could just be more independent and learn to go on his own, our lives would be much easier. We just don't know where to start or how to teach him to do it". Well, here are a few helpful pointers to steer you in the right direction if you are thinking about potty training. 1. Be sure your child is ready. Nothing can de-rail this process faster than starting too early before your child is ready. First, be sure that your child knows where the potty is in your home. If you have a large or two story home, make sure that he/she knows where one is on each floor. You want your child to be able to get to the potty without having to run from one floor to the next when he/she is ready to go. Next, make sure that he/she can independently pull their pants up and down. If he/she needs assistance to get their pants down when it's time to go, chances are you not going to get far in the process. Lastly, your child should have established some bladder control. Meaning he/she can go for at least an hour or two staying dry. If your child is "going" a little here and a little there, well, let's just say that you'll be cleaning up A LOT of accidents. One of the most important elements in the practice of behavior analysis is reinforcement. Positive reinforcement is defined as a presentation of an event/item immediately following a behavior that increases the future probability of that behavior occurring again. So, finding a powerful reinforcer and using it correctly will increase the likelihood of that same behavior it followed to occur again in the future. This is where reinforcement differs from a bribe. With reinforcement we wait for our target behavior ("going" in the potty) to occur and then immediately follow that behavior with the presentation of the reinforcer, therefore we are increasing the likelihood that behavior will happen again. With a bribe we are presenting the preferred item before the expected behavior and hoping that the behavior occurs, (i.e. "mommy will give you this M&M if you go pee in the potty, and then giving him/her the M&M and expecting them to then go in the potty). So as you can see, a bribery and reinforcement are actually very different. Reinforcement, if used correctly, will almost guarantee that the behavior it follows will increase in the future. When potty training, I always ask parents "what is the one thing that your child would do anything to have?". Usually it's something that they don't give their children very often, maybe ice cream, or some other unhealthy sugary treat. Don't get me wrong here, I'm not encouraging you to pump your child full of unhealthy sweets and treats, but if that's what their highest motivator is, then using it specifically for teaching this challenging task may be worth it. There are several other factors that will determine the effectiveness of using reinforcers. You must be sure to provide enough of the reinforcer that it is worthwhile for the child, but not so much that they become satiated. It's also important to have several other "back-up" reinforcers that are strong motivators so that your child does not get tired of always getting an M&M or whatever your chosen reinforcer is. Being consistent and making expectations clear is critical to potty training success. Potty training can be intensive and require a lot of attention for a couple days to a couple weeks. So, make sure that not only is your child ready, but you are ready as well. Being consistent with the delivery of reinforcement and expectations will help ensure that your child is successful. If one parent is doing one thing and the other parent, or maybe a caregiver, is doing something different is almost surely going to confuse your child, and we want him/her to be feeling confident and encouraged during this process, not confused. Having everyone "on the same page" so to speak will help ensure that the process is successful. While these aren't based on research or science, they may be the best tips I can give you. Be patient with your child as he/she is learning to take this step to becoming "a big kid". Be prepared to clean up lots of accidents, and likely go through an entire bottle of laundry detergent in a week from washing soiled undies. On the other hand, be optimistic that success is just around the corner, and know that following through and doing it right the first time, will ultimately lead to your child becoming more independent and confident. Rest in the confidence that in the end all the loads of laundry, soiled rugs, and potential tears, will be completely worth it! Good luck potty warriors! Go out and help your child become the independent, confident, "big-kid" you know he/she is! These are just tips, and developing a potty training protocol is intensive and it is helpful to have a professional oversee a potty training program for a child with special needs. If you are interested in working with us on a potty training program, or for more information please visit our website, and contact us about what we can do to help you through the process. This is a GREAT infographic about ABA!! 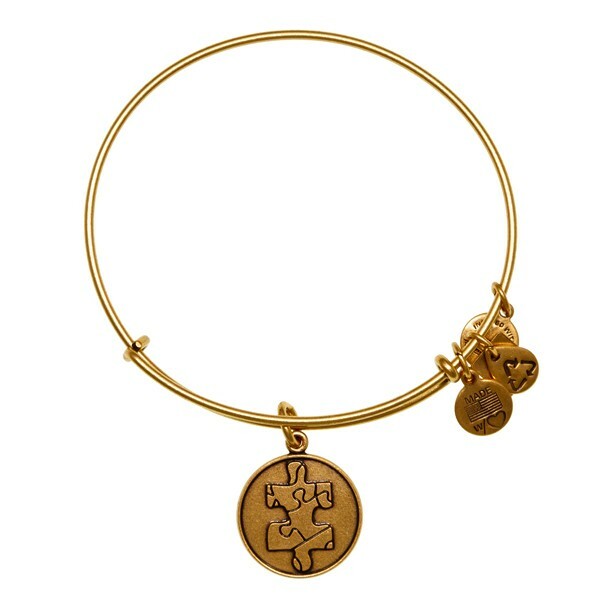 Alex and Ani have designed a beautiful charm in honor of all of us who are affected by autism. It is available exclusively at Alex and Ani retail stores and online at www.alexandani.com. 20% of all sales will be donated to NAA to support our programs for families affected by autism. The National Autism Association is creating an incredible video advocacy project to give children and adults affected by autism a voice and presence in Washington. Help tell autism's story by submitting photos or video to tell your story about autism affect on you or your family. If you want to help "move autism forward", click HERE and find out how you can be part of the National Autism Association's photo and video advocacy campaign to "move autism forward". "It's time to show -not tell- the struggles our community members face"
We've created a Pinterest page! Pinterest is a tool for collecting and organizing the things that inspire you. It is a pinboard-style photo-sharing website that allows users to create and manage theme-based image collections such as events, interests, and hobbies. Users can browse other pinboards for images, "re-pin" images to their own pinboards, or "like" photos. So head on over and check out our pinterest page for "pins" on fine motor activities, DIY teaching materials, sensory activities, craft ideas, and so much more! Click Here to read a great story about service animals for children with autism! Tell us about your experience with service animals and autism.